Little Man actually finished Quran last year, but with a new baby and my little sisters wedding, we pushed his celebration to a few months later instead. We had considered a day out for the family instead or a boys day out with his dad to somewhere like go-karting, but the horrible weather and cost put us off. Being a quiet, modest boy, I thought it would be nice too for him to get some of the attention that the others manage to monopolise most of the time. We picked an easy blue and silver space theme and made the banner and frame a few days before. The stars are the type used in shops and stalls to show prices and we just spray painted silver. (I have no idea how the banner got hung so wonky and I am just realising from looking at these pictures how funny they look). I love to dress my boys up and this outfit was one that Shutterbug Sister bought the boys on their birthdays last year. 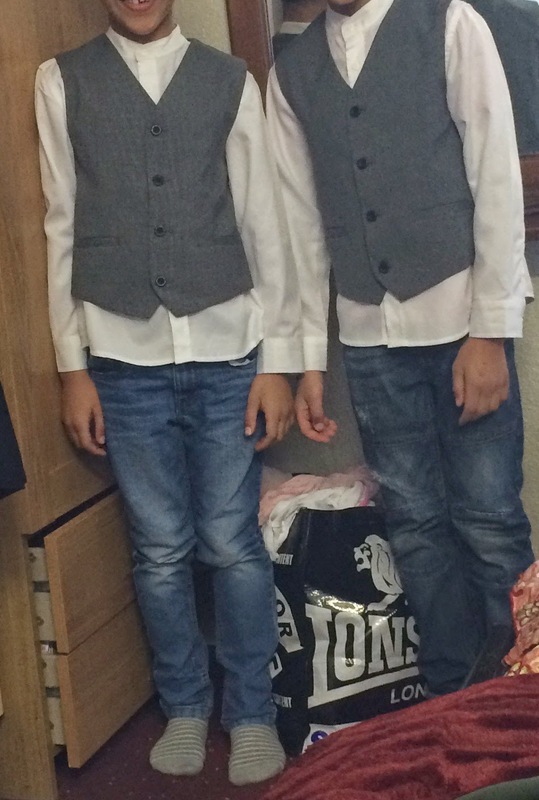 They have matching trousers but I liked the way the shirts and waistcoats looked with jeans, they remind me of the 90's for some reason. Gorgeous refused to wear them saying he would look silly, until I showed him some pictures, then he agreed to try the clothes on. He looked in the mirror at himself and declared "hmm not too bad". 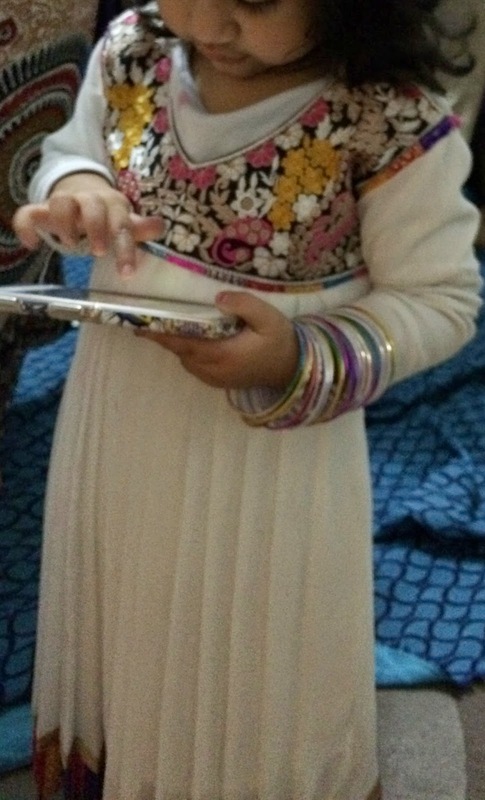 Little Lady, Darling and my niece all wore matching outfits that my mum had bought back from Pakistan recently. Darlings bangles were too big, but as soon she saw them she had then on her arm and there they stayed. Fashionista Sister made cakes for the occasion to fit into the theme. The thing with this type of cake is that sometimes they look good but taste average, but these were delicious and really moist and disappeared really quickly. I always think if nothing else is right, but the food is good, an occasion is saved. This time we made nuggets and fries, macaroni salad, green chutney, potato and chickpea chaat and chicken sandwiches. My mum brought lamb kebabs and my neighbour kindly made some yummy pakora's. My aunt made us chicken biryani. 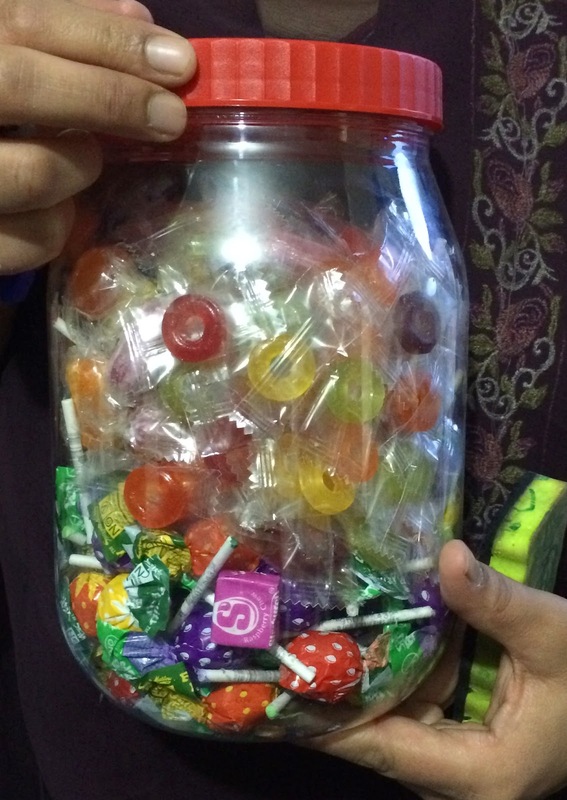 For games we had everyone guess the number of sweets in the jar to be able to keep them. All of the adults joined in and I was just happy that my kids didn't win. It was like a rugby scrum, only more vicious with everyone trying to push their head into the middle of the circle. Very entertaining for the mums. 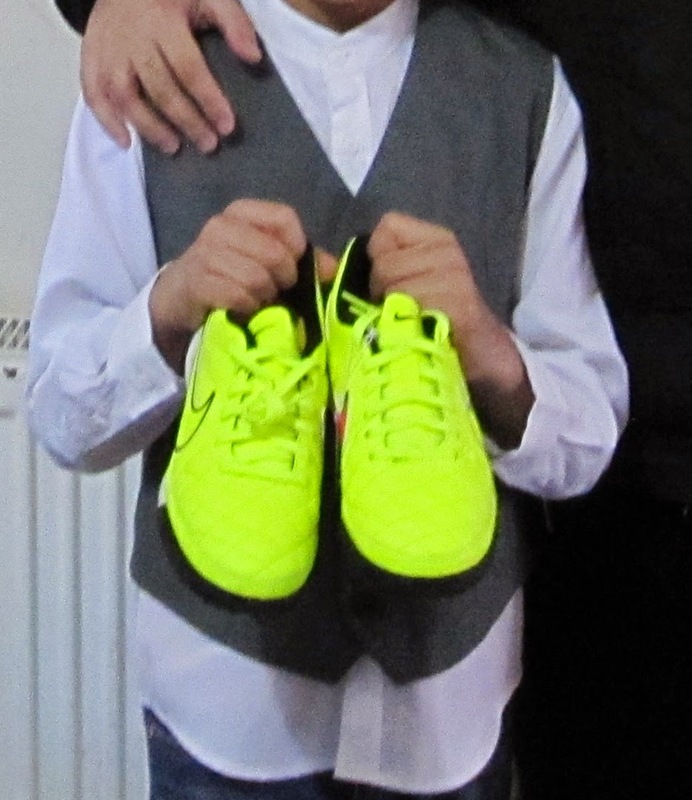 Little Man's favourite part of the party was getting new trainers from Fashionista's husband, who my boys adore and look up to. No chance of losing my son with those shoes on. Although Sweetheart then seemed to think Baby was a toy. My favourite bit of the occasion was when we got all of the children to recite a bit of Quran starting with Little Man who recited Surah Yasin which he is memorising insh'Allah. Even the smallest kids recited a little which was lovely. I make dua that my dear son has an enduring, life-long relationship with the word of Allah and benefits from its wisdom and beauty in this life and the next insh'Allah. MASHALLAH! Congrats to little man. May ALLAH s.w.t put barkaat in his Quranic endeavours and bless him and his parents and family. Ameen. Sum ameen. I am not Muslim, but an Irish catholic. I have an interest in learning about other religions and I just wanted to say that I love your blog. It's really great to read your posts which dispel the views that a lot of Western people have of Muslims in light of various recent tragedies. I also love reading snippets of stories about the Prophet (peace and blessings be upon him). A lot of the stories paint him in a similar light to Jesus Christ, who we Catholics see as the messiah - both good people who set an example for those who follow them. At the end of the day, it's nice to see people of all religions trying to live good lives and treat other people well. It's lovely to read your posts and get an insight into the life of a muslim woman/family! can you please give the recipe for the famous chicken sandwiches? MashaAllah :) Always remember to do all good and permissible deeds for Allah's sake sister in Islam, may Allah the Most Merciful bless you and your family and grant you more wisdom. Ameen.